Start off your visit on the 26th (Fri): contemplate the waterfront views at Pielinen and then stroll through Ukko-Koli Hill. On your second day here, explore the striking landscape of Patvinsuon Kansallispuisto. To see ratings, other places to visit, reviews, and more tourist information, go to the Koli trip builder . Kuopio to Koli is an approximately 2.5-hour car ride. 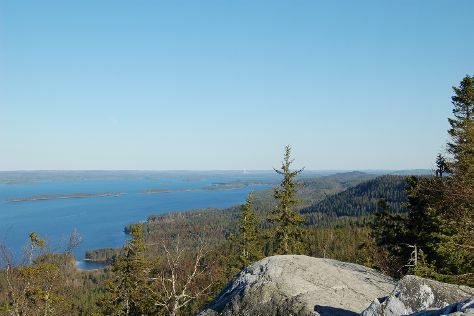 In October, daily temperatures in Koli can reach 6°C, while at night they dip to 0°C. Finish up your sightseeing early on the 27th (Sat) so you can travel to Joensuu. Joensuu is a city and municipality in North Karelia in the province of Eastern Finland. Start off your visit on the 28th (Sun): take in nature's colorful creations at Botania - Botanical Garden and Tropical Butterfly Garden, browse the eclectic array of goods at Joensuun Tori (Joensuu Market), then stop by Kauppakeskus Iso Myy, then don't miss a visit to Sculpture Susi Kosiomatkalla, and finally see the interesting displays at Carelicum. To find more things to do, reviews, ratings, and tourist information, use the Joensuu route planning site . Traveling by car from Koli to Joensuu takes an hour. Expect a daytime high around 6°C in October, and nighttime lows around 0°C. Cap off your sightseeing on the 28th (Sun) early enough to travel back home.